Public libraries across the U.S. are being challenged to reinvent themselves. With the recent partnership of Recorded Books and Atomic Training, libraries now have resources to make that happen. "Today's libraries have to serve the needs of their patrons. That includes expanding services so that libraries remain relevant to the public." In today’s digital media and ebook society, public libraries across the U.S. are being challenged to reinvent themselves. High unemployment rates and increased demand for public internet access are some of the drivers libraries see as opportunities to reinvent themselves. The 2012 American Libraries Association report on the State of America’s Libraries revealed that a majority (70%) of libraries reported increased use of public access computers. “Today's libraries have to serve the needs of their patrons," said Clay Moore, Atomic Training’s National Sales Manager. "That includes expanding services so that libraries remain relevant to the public." The recent partnership between Recorded Books and Atomic Training has been able to provide libraries across the country with a comprehensive online database of how-to training tutorials. This online tool has training covering popular Microsoft®, Apple®, Adobe® and Google™ software programs. With Atomic training, libraries are able to expand their digital library without downloading or installing new software. Not only do Library patrons have access to over 45,000 on-demand video training tutorials with Atomic Training, but patrons are able to use that knowledge to improve their job skills, expand their resume, or upgrade to newer software all through their library membership. 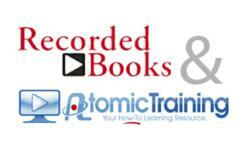 For more information regarding Recorded Books’ Atomic Training for Libraries service, please contact us by email at atomictraining(at)recordedbooks(dot)com, on the web at http://www.recordedbooks.com, or by calling 1-877-828-2833.